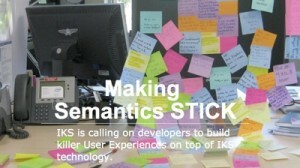 The IKS Semantics UX Contest attracted 18 eligible proposals for evaluation. Participants in the first phase of evaluation were asked to submit a proposal (on average 20 pages) to demonstrate benefits to an end user group, by making significant use of IKS technology. Given the very demanding nature of this contest we were impressed with the number and quality of the submissions. The proposals needed to satisfy the four main conditions of the contest: Semantically Enriched User-centric Story. The proposed solution should provide a compelling semantic experience for the end user of the contest. Contestants were asked to either start with the existing IKS User Stories or bring their own ideas; Bring new levels of Semanticity to CMS platforms. The proposed solution should leverage any kind of existing CMS/KMS/ECM system and should ideally be implemented in hours rather than weeks; Free and Open Source Deliverable. The awards will let the winners finance the development and implementation of the work. In exchange we strongly encourage the deliverables to be released under a permissive open source license; and Leverage the existing IKS Semantic Stack. The proposed solution should leverage the existing IKS technology stack and reuse as many components as possible. All 18 proposals are listed below with name, organisation and abridged versions of abstracts. In fact the quality of the proposals made the job of evaluation for the members of the IKS Executive Board and Industrial Advisory Board a tough one. Unfortunately in the end we could only pick 5 for the next stage of evaluation. The top 5 are also listed below. In the second stage, the top-five proposals, must convince three judges and a CMS audience that their proposal is worth spending 40.000 € on “making it fly”. This contest pitching event will take place next week in the context of the J.Boye conference. So if you are at the conference then make sure you join us to vote for your favourite. On behalf of IKS we would like to thank the teams behind the 18 proposals for their hard work and great ideas. We will continue the discussion with all of them on how to realise their ideas in some form. Knowledge Media Institute, The Open University, United Kingdom. “DATAMI – Personal Web Analytics as Semantically Enriched Web History”. We propose to develop the DATAMI application in order to support users in managing their interactions with content on the Web. Here, we propose to build on the Stanbol Services, on the VIE framework and on our previous work regarding the semantic monitoring of users’ Web traffic to create an application for Personal Web Analytics. The idea is to track the user’s interactions with online content through a local Web proxy, connect the collected information to a semantically represented personal profile of the user, semantically enrich this personal Web history with additional information about the entities involved, and provide an interface for the user to visualize, explore and make sense of his/her activities online. From the user’s point of view, DATAMI takes the form of a personal analytics dashboard, where information about his/her interactions with online content can be visualized, filtered and navigated through common structures (e.g., relations between websites, locations, projects), entities (e.g., people, organizations) and relationships (with the user, or other online entities). The DATAMI application will be developed through the reuse of existing open-source components, originating from the IKS project and other communities. Zaizi, United Kingdom. “Semantic Search Tool”. Our solution is to provide a semantic search tool built within Alfresco ECM that can be used to carry out effective collaborative research. I have a large collection of documents and digital assets (images, videos, audio, etc.). All the assets in the CMS have been semantically enriched, mapped to an ontology and stored in the integrated RDF store within the CMS. The search tool should provide a number of searching techniques across the whole repository. The search tool will combine different types of search within the same user interface and allow users to switch between different methods and views of the assets. InsideOut10, Italy. “WordLift” – The first release of WordLift is providing WordPress users with an attractive SEO tool that leverage on the adoption of Schema.org by the major search engines and the power of IKS. With the upcoming release we plan to: • Move forward with the implementation of Schema.org by adding places (http://schema.org/Place) hence providing a further enhancement for the organic search; • Reshape completely the philosophy behind the Plugin to make a further big step towards content findability while extending the classic information architecture for content-intensive website (sites or blogs with a large amount of information that can be inter-connected by semantic means). The idea is to provide WordLift with enough power to index each post, store all entities accross the same blog and implement a full set of new navigation patterns the editor will choose while customizing the site UI. The new navigation patterns will help the user contextualize the post, access similar content from and within the same post (without bothering to use the main navigation menu) and access the content in a widgetized form using web syndication strategies. Liip AG, Switzerland. Concept – The CMF is a set of highly configurable, decoupled components that form building bricks for CMS functionality. Implementors can choose which components they need and customize them or replace parts for specific requirements, completely replace components and add their own components. At Liip, we want to improve the CMF editor component we are currently working on and build a semantically enhanced editing interface. Apache Stanbol sounds like the perfect server component to achieve this next step. We include a couple of user stories. Of course, the features will separate logic and design, allowing others to use their own designs with these features and this workflow. User Stories – As an Editor, I want a semantically advanced asset management tool so that I don’t have to search for images and tag them myself. As an Editor, I want to have my content automatically linked together so that I have a new way of navigating in my website. As an Editor I want external data to be suggested and linked to my content so that I can enrich my content automatically. As an Editor I want my content to be tagged automatically so that I don’t have to do it myself and so that all my content keeps a high level of quality. As an Editor I want advanced functionalities to save the work I’m doing so that I and my coworkers don’t lose time and important data while working. InfoAxon Technologies, India. The proposal explains 3 different user stories; Semantic UI Editor for “Knowledge Products” Creation; Intelligent Content Auto Tagging for CMS Documents,; Semantic Rich Job Feed Aggregation for Social Housing Citizens. Ximdex, Spain. “Zenti” – Semantically enrich social media content and not only traditional KMS/CMS types of content. Kendra Initiative, United Kingdom, “Kendra Hub” – The aim is to increase the depth and breadth of the semantic universe by providing easy to use tools that enable those people, with limited technical know-how and/or resources, to expose their own rich semantic metadata to media customers, beginning with search engines and including aggregators and distribution chains. Quadra Informatique, France. “Collections Management for Semantic Indexation”. EAST Team, “Book of a Book Project”, Semantics books editor service built using java, meant to help book writer, book editors, book publishers, semantic service developers and content management systems providers to enhance unstructured content (i.e. Books) using semantic annotations to be able to link books with related entities and topics using IKS components. SUNGUARD, Germany. “IKS with Business Process Management”. To enhance a BPMS with IKS to provide semantic data integration and search capabilities for business workflow management and further enhance the built-in CMS. Quadra Informatique, France. “Automatic Input for Citizen Relationship Management”. Webikon, Romania. “Semantic Annotation Interfaces”. Develop a set of interfaces aimed at combining the semantic annotation with ontology navigation and visualisation. The interfaces will be implemented as a set of Drupal 7 modules and libraries to ease deployment using the D3.js library together with Drupal’s core jQuery. The integration will implement the new multilingual features available in the current Apache Stanbol release. Verinote, Scotland. “Semantically Enhanced Knowledge Acquisition and Collaboration”. An online educational/collaboration tool built within a dynamic CMS which is enhanced to allow the benefits of the semantic web to be used for creating contextual prompts, information sharing and collaborative working. Evo42, Austria. “Widgets for a better Web – Easy markup to improve the display of search results”. University of Warsaw, Poland. “The Project of Yours”. A wiki-like content management system for collaborative projects, with built-in tools for semantic content enhancement using linked data. Ximdex, Spain. “Pervasive and Ubiquitous annotations in Ximdex with IKS Technologies”.